SCOTT Bowman leans against a book-case in his 'civvies' and favourite Indigenous print tie, formal robes slung over a coat rack to his left. Behind him a Santa cap perches on a basket ball next to ceramic artworks, a globe, an elephant, and three framed photographs. 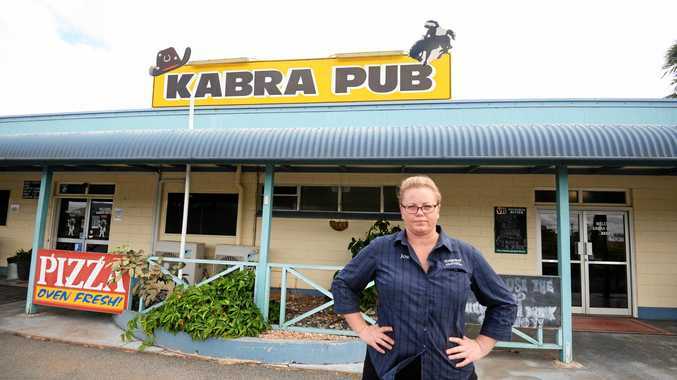 The first is of his wife Anita, another of former British Prime Minister Winston Churchill, and the third a single-engine Jabiru J230C aircraft Mr Bowman piloted between regional Central Queensland campuses. This is the official portrait, unveiled on Wednesday , which portrays Mr Bowman "not only as retiring Vice Chancellor but as a person with far-reaching interests," according to artist Deidre But-Husaim. 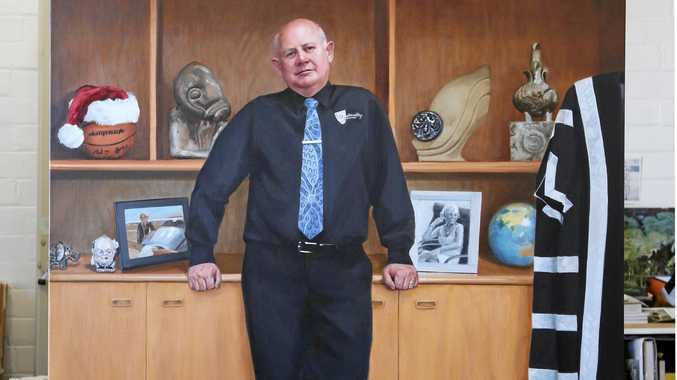 All the details in the painting, acquired by the CQUniversity Art Collection, hint at Mr Bowman's life as "richly lived, past, present and future," the artist said. 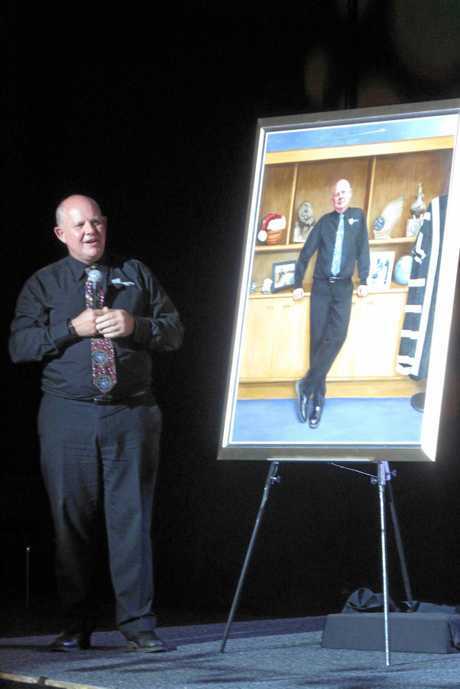 Prof Scott Bowman's portrait was unveiled during his final week. It is a fitting tribute to a man who's reshaped the region's education landscape while maintaining a passion for the CQUni Tigers, pottery, world travel and family. Chancellor John Abbott honoured the "significant and lasting" contributions Mr Bowman made over his 10 years as Vice-Chancellor and President of CQUniversity Australia in appointing him Emeritus Professor. "Scott has exhibited a deep commitment to engagement and social outreach throughout his career, [expanding] our geographic footprint to more than 20 delivery sites across Australia, making education more accessible and better supporting the needs of our students," Mr Abbott said. "These students are now graduating and entering local employment, enriching the professional skill sets of the local workforce, value adding to the local economy, and providing for their families. "Scott's regime of continual campus investment saw more than $200m invested in capital works across CQUniversity's footprint and supported growth in staff, courses and facilities across Australia, all of which played a pivotal role in the economic and social development of the communities we serve. "Additionally, the historic merger with Central Queensland TAFE in 2014 to establish Queensland's first truly comprehensive university is further evidence of his leadership, vision and commitment to continually innovating regional education offerings for the benefit of our communities." Following a surprise visit from family members, Mr Bowman said the final farewell event he shared with about 300 people was "one of the highlights of my life." His two children, Adam and Anneka, and four grandchildren attended the event.